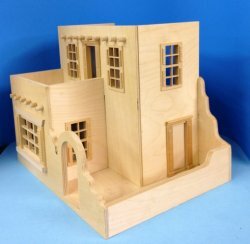 This house measures 12 1/2" across the front, 9 5/8" on the sides, and 10 1/4" tall. It is southwest in design with a courtyard with an arched entrance. It has a door at the side entrance of the courtyard and one that opens onto the upper courtyard. It has a large window on the ground floor and one small window on the ground floor, with three windows on the upper floor. It has a set of stairs that has a landing then turns to go to the upstairs. There is a large arch between the downstairs room and another small arch between the upstairs room. It would be great to stucco it and stain the wood that shows.